Samco Services - Garden Services, Rubbish/Waste/Clearance based in East Grinstead, West Sussex. Welcome to Samco Services. We are based in East Grinstead and operate within a 20-mile radius (Crawley, Horley, Uckfield, Tunbridge Wells, Edenbridge, Uckfield, Smallfield, Lingfield and all of the towns and villages in between). We have been established since 2011. We offer a full range of Clearance and Garden Services. Whether you need a full House Clearance or a tidy up of your back garden, we can be of assistance. We are also Commercial Clearance specialists and can clear offices, warehouses and other commercial premises. Samco Services was created because we wanted to offer our customers the full package. Instead of having to find separate companies for the clearance side and the garden aspect which can be a real hassle, we can do both. No job is too big or small and we are always happy to help. You may be looking to have a few boxes of rubbish removed, an old sofa disposed of, a back lawn mowed or a whole mansion to be cleared; Whatever the need, Samco Services have the solution to help you. Nowadays time is of importance, why not sit back and relax and let us take a bit of the stress away from you. We are friendly, local and independent and believe in the philosophy of putting our customers first. We have a full waste disposal license as required by the Environmental Agency and have our own tools and equipment. We have established relations with local estate agents and solicitors and also work with private house owners and tenants. You can rest assured that a clearance carried out by ourselves is above board and we will recycle as much as possible. Many companies will come in and dispose of everything in the house which will then end up in a landfill, this is a real shame in this day and age, especially where a lot of items have life left in them. We take into account items with resale value and also give items to charity. Any items that cannot be reused are disposed of and recycled in the correct manner. 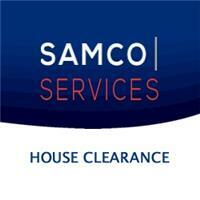 Samco Services is a trading name of Samco Group LTD.